There are a few questions which, while likely never answered to everyone's satisfaction, continue to attract the attention of each new generation, because they are always relevant (somehow) to the problems of the current day. One such is, "why did Rome fall?" I'm not touching that one today (or maybe ever). But, there is another one which is a relatively recent addition to the elite group of Big Questions of History, that I think it is time for me to take a stab at. Wrapped up in this question is the flipside, which is, "why did it end?" You haven't really answered either question until you've answered both. At the time, of course, a lot of people thought they knew the answer. Karl Marx (and company) had predicted that capitalism would destroy itself, and it seemed to be doing so. When someone predicts a great crisis, and then it arrives, that adds a lot of credibility to the person who made the prediction. With the benefit of hindsight, we can say that Marx's analysis of how the economy works is...lacking. For one thing, Marx didn't anticipate capitalism rebounding from the Great Depression. Then there is Keynes' theory of the Great Depression, which more or less was, "everyone is scared". Scared people spend less, resulting in less demand for everything else. The economy would thus be a sort of bistable system, with either an optimistic, bullish attitude (so everyone is confident and spends, resulting in everyone else having lots of business), or a pessimistic, bearish attitude. Keynes' solution was therefore that we should have the government spend more, resulting in everyone having work, resulting in a better attitude all around, resulting in private sector spending increasing. The problem with this is that it is always possible, when this doesn't work (as it did not with FDRoosevelt, and hasn't with Obama now) to just say, "he didn't spend enough". Keynes' analysis tells you what to do, but it's not 'falsifiable', i.e. there's no possible result it can't explain. If things get better, then the government spending worked. If they don't, you didn't spend enough. A theory that can explain anything (after the fact), also can't rule anything out, which means it can't really predict anything. Which means it's bogus. Then there is the Milton Friedman story of the Great Depression. In this story, the Federal Reserve caused the Great Depression, by maintaining tight money at a time of a recession, which would have been a normal, relatively mild one if we had used either a conventional gold standard or the later, modern-style Federal Reserve strategy. Instead, tight money in a time of recession was like putting an ice pack on a patient whose body temp had dropped too low; the wrong medicine, making a bad situation worse. By the time the Fed realized its mistake and changed course, the economy had been so badly damaged it took years to pull out of its slump. This analysis is basically what was used by the Federal Reserve for several decades; when unemployment is high, lower interest rates, and when inflation is high, raise them. At the time of the late 90's, it seemed to have resulted in the Great Moderation, and Friedman's theory was widely believed. Needless to say, the results of the new millenium have put a fair-sized dent in the confidence in this theory. One idea back in fashion is that of Hayek and Mises (aka Austrian economics). To summarize greatly, the idea is that at any point in time there are only so many good ideas which need financing. If there is Just Enough capital available to finance them, we have a good economy; all the good ideas get financed, and all the financing turns out well (because it was invested in good ideas). This results in more money being available for financing more ideas, and that means some not-quite-as-good ideas get financed. That may still work out ok, but eventually we get to a point where there aren't that many good ideas out there which aren't already financed; still the investors need to put their uninvested capital to use in something, and their string of successes have made them cocky, so they invest in a lot of not-very-good ideas. Big skyscrapers get built, no one wants to rent them, and then comes the crash. Once the economy is no longer going up, it must go down, because a lot of the ideas which were just barely viable in a booming economy now become not quite viable. Those investments going bust makes things a little more negative for everything else, and now some investments which would work in a normal economy are no longer viable, and more things go bust. Eventually, even good ideas can't get financing. But, people keep having ideas, even if they can't get them financed. Eventually, there is a backlog of good ideas needing financing, and the bad ideas have been finally wound down, and the financiers have (what's left of) their money back. They look around for something to invest in, and find that there are a lot of good ideas to pick from. The cycle starts again. So, in this analysis, what caused the Great Depression was...the Roaring 20's. If the economy is booming for longer than usual, it will crash harder than usual, for that very reason. That means that the current "Great Recession" (more on that name in a minute) is a result of the economy before it. The 90's were a boom time, and when it came time for a bust in the early noughties, we used war spending in Iraq and Afghanistan to mask the reality, so that the bust is bigger now because we put it off. In this analysis, using government spending to heal the economy is like drinking more to cure your hangover; it may feel like the Hair of the Dog is helping for a little while, but the real problem is actually getting worse. The problem with the Austrian Economics solution is that it doesn't really explain much. In some ways, it's just the opposite of the Keynesian one. If the economy has a bust, your government must have been spending too much. Cut government spending (and regulation) until things get better. But, the economy of Hoover and FDR's time (pre-WWII) wasn't particularly free-spending compared to, say, Ronald Reagan's administration, and it definitely regulated less than in Reagan's time, so why did we have a Great Depression then? Or, as the amount of government spending and regulation has gone up over the course of the 20th century, why haven't Depressions happened with increasing frequency? Here's what I think is wrong with all of these economic theories: they're about money. I am convinced that any theory of economics which talks about money a lot, is bunk. Money is not wealth, and "making money" is not the same as economic activity. I realize that this might be a minority view. Whether you think we should be cranking up the money-printing presses, or converting to the gold standard, you probably think that the money question is important. I don't, particularly. An analogy may help here. Money is to the economy, as a speedometer is to the automobile. It's a handy device, much better for determining how fast you're going than just looking at the landmarks and guessing. If your speedometer is broken, you should get that fixed immediately. No car without a speedometer can be said to be in good shape. But if your car is pulled over at the side of the road, with smoke coming out of the engine? Don't bother trying to physically reach in and move the speedometer needle up; that won't help. It also won't help slow down or brake the car, to physically move the speedometer needle down to a lower number. Money measures what's going on, it doesn't cause it. To use a different metaphor, money is like subway tokens. If you have a problem with your mass transit system getting people to the right place on time, printing more subway tokens is unlikely to be the solution, unless you actually have so few that no one can lay hold of any. It's not that your subway token system CAN'T be so screwed up as to be a problem, but the vast majority of mass transit system problems aren't caused by the subway tokens. If there's a problem with your economy, and you don't have hyperinflation or a barter economy, then money is not your problem, and changing the money supply won't help. So, what is the problem? Well, it can be lots of things, and in some sense there is ALWAYS something wrong with the economy. There is too much of something being made, so the price goes down until it's not profitable, and some of the people making it start making something else. There's not enough of something else, and either some more people start making it, or the people using it try to find ways to do without it or at least use less. The great advantage of a market-based economy is that it gives a distributed, more or less automatic way of making these decisions. Of course, that doesn't mean these decisions are EASY, just that they are automatic. The consequences can still be hard to endure. For example, what if the price of food keeps dropping and dropping, as technology makes it cheaper and cheaper to produce vast quantities of any given kind of food? The logic of the market (and, incidentally, also the logic of any other kind of economy) requires that some people who currently grow food, will have to do something else. This may be fine by them, but then again, it may not. What if owning a farm of your own is the aspiration of too many people? What if owning your own land, growing your own food, being the yeoman farmer of the Jeffersonian vision, is the American Dream? If you look at a graph of the total and farm population of the U.S., it is suggestive. The total population continues to grow from 1790 on. The farm population, however, peaks around 1910, and thereafter declines. From our 21st century perspective looking back at it, this seems like a normal, perhaps even desirable, in any event inevitable result of the mechanization and industrialization of agriculture and the economy generally. From the point of view of people at that time, though, it was neither inevitable nor desirable. Even though an increasing percentage of the population was not living on farms, by 1930 they were still around 25% of the total population. More importantly, many of the urban population, immigrant or native born, aspired to landowning, which at that time mostly meant farm-owning. While 25% is by far not the majority, it is still large enough that many more could believe that they might someday get enough capital to buy land, and be the American yeoman farmer. Look at the total farm population curve. 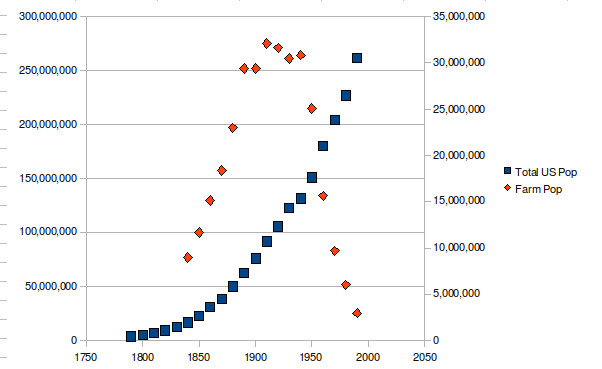 In broad terms, the population is a bell-shaped curve, peaking around 1910. The next couple points are only slightly lower, but the decade from 1930 to 1940 is what should be the steepest decline. I am tempted to attribute great significance to the fact that it is precisely this point where there is a "blip" and the farm population refuses to go down for a few years, but let's not attribute too much to one data point in any chart. Essentially, the economy had changed, and it was time for large numbers of people to move off the farms and into the cities, to work in factories. But, people don't always do what they are "told" to by the market. In fact, shortly before the time the farm population peaked, large numbers of agricultural immigrants from Mexico and elsewhere came into the U.S. agricultural industry, unwittingly increasing the pressure in a market for which too many people were chasing too few spots. The best agricultural land in the U.S. had all been claimed by the end of the 19th century, and the attempts to farm marginal land (using farming methods that originated in wetter climates) led to the Dustbowl. Most of those forced off their own land attempted at first to find agricultural work elsewhere, rather than moving to factories in the city. Now let's think about the way the market is supposed to work. Suppose there are too many people making widgets of type A. The price will drop for type A widgets, some people will no longer be able to make a living, and some of them will try their hand at making widgets of type B instead. If they get a better return, others will notice their success, and also switch from making widgets of type A to making widgets of type B. Eventually, the return from both types of widget-making will be roughly the same, and all that has changed is that now more people make type B than before, and fewer people make type A. This can work, if people have no particular attachment to whether they make widgets of type A or type B. If they do have a preference, then the expected difference in income from making type A vs. type B should roughly reflect that. In other words, if people making type A widgets make $30,000/year and people making type B make $40,000/year, then apparently the non-monetary advantages of making type A are worth around $10,000/year to the people who stick with type A, otherwise they would switch. What if they have been raised to believe, though, that the American Dream is to own your own farm? What if they think that farming is a morally superior way of life? What if they think that staking your claim to your own land is the goal they should aspire to, and taking a job in a dirty urban factory is giving up? How much money per year does it take to make people give up on their lifelong dream? We are coming to the next part of the two matched questions of the Great Depression. Why did it end? It seems clear that it ended with World War 2, but different camps interpret this in different ways. Keynes believed that it took a war to finally convince the governments of the world to spend in sufficient numbers to stimulate the economy enough. Moreover, the psychological affects of war overwhelmed those of a slow economy, and once it was over the simple rush of relief that they were no longer at war caused a flood of purchases (and, by the way, also procreation) that gave the economy enough private sector purchases to be self-sustaining. Other schools of economic thought give different explanations (mostly less plausible). The problem with the Keynes' model is that it doesn't have much more than one data point to support it. The spending associated with the Vietnam War seemed to lead to a period of economic decline in the early 70's, not prosperity, and in any case looking at governments worldwide which have bigger and more sustained deficit spending to get out of economic slumps (e.g. Japan in the late 90's) doesn't do much to recommend this. I suggest that there is another, very different reason why World War 2 ended the Great Depression: it forced us, as a nation, to go ahead and change in the way we needed to. We needed a large fraction of the nation's people and money to leave the farms, and go to the urban industrial economy. Because it was for a war, people gave up their American Dream of being a yeoman farmer, and either fought for their country or worked in factories making the material that war required. U.S. government spending surged into factory building, and after the war the same factories that had made tanks and bombers could make cars and airline planes. Equally important, by the time the war was over, people had changed their idea of what the modern objective was. Women had worked in factories. Men had served in a large, hierarchical organization, preparing them to return home and become corporate Organization Men. The American Dream became a home of your own in the city (or a nearby suburb) and a secure factory job. To make the point even more clear: spending lots of government money on, say, paying people to work on farms, would not have ended the Great Depression in the U.S., no matter how much of it was spent. Money is just a way of keeping track of what is going on in the economy, it is not the economy itself. What really matters, is who is doing what, making what. If you don't change that, the economy is depressed, and it will remain so no matter how much money is printed or borrowed. The New Deal failed, because it did not force people to change what they were doing, it just helped them to survive while doing it. World War 2 did what the New Deal could not. WHY IS THE GREAT RECESSION HAPPENING? In the years from 1918 to 1939, World War I was known as "the Great War". When children in the year 2050 learn of the Depression of the 1930's, will they learn it by the name of the "Great Depression"? Or "Depression I"? Let it pass; we will stick with the term "Great Recession" for the current economic downturn, since it seems to be the name currently in use. Armed with what I believe to be the correct answer to the question of why the Great Depression happened, we can look at the Great Recession in a different light. There is some thing (or perhaps more than one) which our economy needs to do, which we are not letting it do. The Great Recession can last indefinitely, until we make the change (whatever it is). The economy's slumber is not the actual problem (though it is bad), it is a symptom of the problem, like a fever. We cannot effectively treat it, without knowing the cause of it. First, though, perhaps I should convince the reader that what we are facing is not a normal recession; not even a more severe than normal recession. To do that, take a look at the following image. Interestingly, you get a very different perspective if you compare recoveries instead of recessions. This is because, while the supposed length of the Great Recession was not abnormal (because our official definitions of "recession" and "recovery" are flawed), the amount of time it is taking to recover the jobs which were lost is extraordinary. Most importantly, at the current rate, we will not have recovered most, let alone all, of the jobs lost, by the time the next recession hits. What happens to an economy when there are still several million people out of work from the last recession, when the next slowdown begins? 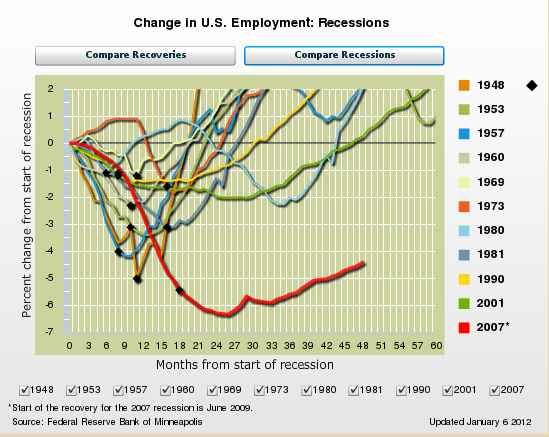 Let's look at a subset of the previous graph, with just the four most recent recessions shown. 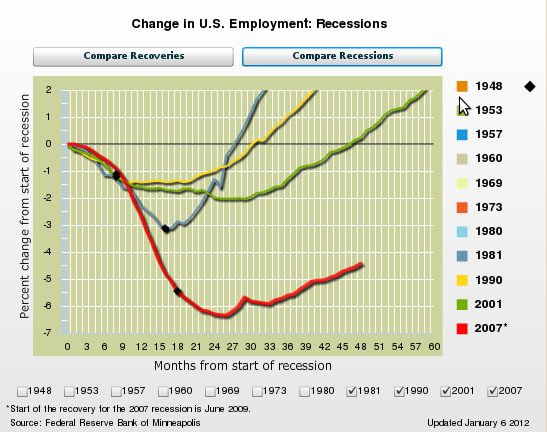 In the 1981 recession, we had recovered the jobs lost in a little over 2 years. In the 1990 recession, it took more like 2 1/2 years. In the 2001 recession, it was nearly 4 years. We don't know how long it will take to recover the jobs lost in the 2007 recession, but it will be more than that. In fact, the impression I get is of a boxer who is recovering a little slower from each punch that lands home, until he is unable to get his guard up in time to defend against the next one, and the next punch sends him to the mat. What caused the Great Recession, then? The first suspect would be the house-building industry, if we include in that the home finance industry that sprang up to cater to it. We built ever bigger houses, further and further from the cities where we were working. Housing is certainly necessary for any economy, and in the most desparately poor nations of the world a bout of house-building might well improve the economy by giving stability and shelter from the elements for the people who live in them. But, the changes in American housing from, say, 1980 to 2010 cannot be said to have improved our productivity in any way. In essence, the money spent on housing in the last several decades has been squandered. More importantly, the time and material resources were squandered. I don't think Americans are even more happy with their houses than they were in 1980. What could we have done instead? People have to live somewhere. In modern (urbanized) nations, those who do not live in houses, mostly live in apartments or condominiums, in other words in higher-density buildings, closer to the city core. If we had, from the mid 20th century on, built denser dwellings, we would likely not have expended nearly as much effort or required nearly as many material resources (lumber, metals, etc.) to shelter us all in comfort from the elements. Like the migration from farm to (sub)urban house, the migration from house to apartment building or condominium is a straightforward step on the path towards greater population density. What mostly stops us is not what people want (people can live just fine in nice apartments), but how they define success. Owning a home is the late 20th century American Dream, and people do not give up on their dreams easily. Now, however, we come to a second problem: Americans, by and large, get where they are going by driving in automobiles. Not just farmers, who have clear needs for pickup trucks and the like, but urban office workers. If the U.S. had the population density needed to stop dumping its resources into housebuilding, it would find that cars are not a good way to achieve this (with the possible exception of the newer business models based on carsharing). Buying fewer cars would probably not be a big problem for the U.S.; the Big Three American automakers haven't been a potent political force in decades. However, if we lived in apartments and condos in the city rather than big houses in the suburbs, there would be one dramatic change: we would use a lot less oil. Not only because mass transit uses less energy than everyone driving their own car, but also because apartments and condominiums use less energy to heat and cool than an equal number of houses. The automobile/suburb society is based on cheap oil, in the same way that the Jeffersonian ideal of the yeoman farmer was based on cheap farmland. This doesn't necessarily mean it was a mistake; every social model has to make some assumptions about what is plentiful and what is scarce. But this means, built into every societal system, there is a hidden timer. For the Easter Island natives that built the famous monolithic statues, it was plentiful timber. For the Anasazi in the american Southwest, it was plentiful water. For the early American Dream, it was cheap (mostly free), high quality farmland. For the society we currently live in, it is plentiful fossil fuels (oil, coal, natural gas). If we look at the price of oil, and compare it to the U.S. GDP growth, we see that they are obviously related. More intriguing is to figure out WHAT the relation is. Clearly, this relationship works both ways. It is fairly well-established that high oil is both a result of a robust economy, and also a factor in slowing economic growth. The cycle, then, goes from higher economic growth -> higher oil prices -> slower economic growth -> lower oil prices -> back to higher economic growth. The economy in recent years has resembled a backfiring car, lurching forward briefly only to misfire and rapidly decelerate again. This relationship to oil is, I believe, the fundamental reason why. What is different, lately, to cause this problem, and why wasn't it a problem before? Essentially, we can say that it is the growth of a middle class in India and China. Technically, Brazil and others have also grown economically, but the sheer size of India and China's economies dwarfs the others in their affect on the world markets. To put it bluntly, we have had more rapid growth in the size of the world's consuming class (those with enough income to afford a car, a house, etc.) than we have had growth in the world's available fossil fuels. We cannot stuff the genie back in the bottle; India and China will not give up on aspiring to the same middle class existence the West has, nor will the many other formely Third World countries who are clawing their way out of poverty, and burning a lot of fossil fuels to do it. 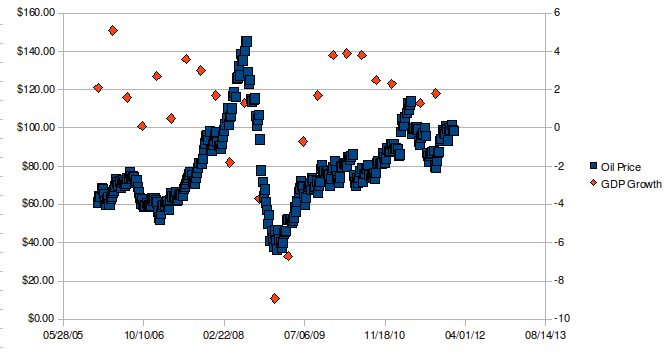 This being the case, the spike in oil prices in mid-2008 was the classic response to a shortage. If supply cannot rise in response to rising prices, then they will continue to rise until demand drops instead. If we have not increased our energy efficiency enough, or substantially shifted away from fossil fuels, then how can demand for fossil fuels drop? The only way left, is a recession, and so oil prices rose of necessity until they were high enough to cause a recession. To put it more bluntly: the price of oil could and would have gone higher, if necessary, until it forced down the demand for fossil fuels. If the world economy had been able to sustain $150/barrel oil and keep growing fast, then the price of oil would have hit $175/barrel. If the world economy had been able to sustain $300/barrel, then it would have hit $325. In a shortage situation, the price is bid up until someone drops out of the bidding war. There is nothing keeping us from switching to other energy sources, regardless of what the fossil fuel extraction industries tell us. Society once ran on human and animal muscle power, then it ran on woodfires and windmills, then steam engines powered mostly by coal, then on electricity generated by coal, oil, and gas. It can run on other sources than fossil fuels. The fundamental limits on our use of wind or solar energy is not a raw material, but our manufacturing prowess in making solar cells and wind turbines. Since manufacturing gets cheaper as volume increases (unlike raw materials such as fossil fuels, which get more expensive), the backfiring economy could break the cycle: increase demand for manufactured energy such as solar or wind would result in dropping, not rising prices for energy. More importantly, there are numerous ways we could use less energy in the first place, not least by changing the places we live and how we move around. But, it would be a big change; it would require people to change their idea of what constitutes Success. Like the 1930's America didn't want to give up on the idea of owning their own farm, 2000's America didn't want to give up on the idea of owning their own house (with a car of their own in the driveway), even as the price of a house rose much faster than inflation (or their incomes). There are other groups that don't want us to switch, either. If we didn't need loans for house buying, or car buying, where would the finance industry be? It would be much smaller. Why is this essay titled "Raindance"? The main reason is, what our government (Republican or Democratic) does in response to an economic crisis, is a raindance. They don't really have any idea what to do to fix things (make the rain come), because they cannot change government policies subsidizing homebuying, or using military force abroad to keep the oil flowing. That would require taking on the same forces that put them there, and are perfectly capable of removing them. So what can they do? What they do, is try to LOOK like they are doing something, and wait for the recovery to come, like a raindancer who keeps dancing until it rains, then takes the credit. Most of the time, this works, because most recessions only last 2 years or so. However, what if something actually needs to be changed? The U.S. government hasn't really faced a crisis which it HAD to solve, since World War 2. Ever since then, all it really needed to do was look busy, and wait. Even the Cold War was primarily a case of the U.S. waiting out communism, until it collapsed of its own internal issues. More important than whether U.S. politicians know how to solve problems, was whether they knew how to position themselves to take credit when the problem got solved by something or someone else. Drought has laid low many civilizations before. How long do you think it took, before people stopped expecting the raindance to eventually work? What happened when people stopped hoping that they would be able to grow enough food again? Did they turn on each other? Did they turn on their leaders? The rains will not come this time, because this problem will not solve itself. The economy will not truly recover, until we no longer rely on plentiful fossil fuels to power it, and that is not something that will happen under current policies in favor of widespread housebuying, car ownership, and military expenditures abroad to secure oil. Note that I do not say it will merely not produce as many good jobs as before; that has been the case for a couple decades already. Rather, it will not EVER get back to the number of jobs we had before the Great Recession began in 2007. Let's hope this time it doesn't take a World War to get us to change.